McGill Neuroscience brings together over 350 scientists and clinicians, 800 graduate students and post-doctoral fellows working across a broad spectrum of fields and disciplines. Taking full advantage of these great minds, Healthy Brains for Healthy Lives (HBHL) will focus on some of the most complex and costly conditions facing our society. It will do so by narrowing in on several key research themes and platforms. McGill is uniquely positioned to advance the world’s search for neuroscience knowledge and therapies at a variety of facilities. The Montreal Neurological Institute and Hospital, the largest specialized neurological research and clinical centre in Canada, and among the largest in the world. McGill Centre for Research in Neuroscience, whose breakthroughs in neural regeneration following trauma paved the way for fresh insights in our understanding of brain diseases. The Douglas Mental Health University Institute, a leading Canadian research centre in mental health and home to the Bell-Douglas Brain Bank, which has made signal contributions to suicide studies, and aging. 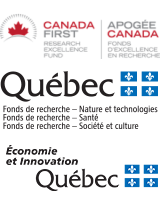 McGill University and Genome Quebec Innovation Centre, with the largest genome sequencing capacity in Canada. The Lady Davis Institute for Medical Research, a world leader in molecular oncology, cell and gene therapy, and the psychosocial aspects of disease. The Ludmer Centre for Neuroinformatics and Mental Health, home to one of North America’s most powerful computing and neuroinformatics infrastructures, CBRAIN (Canadian Brain Research and Informatics Network). McGill University Health Centre (Montreal General Hospital), housing the Traumatic Brain Injury Research Unit and Program, a Level 1 trauma centre that treats 9,000 patients annually. The McGill Centre for Integrative Neuroscience, conducting computationally-intensive brain research using innovative mathematical and statistical approaches. The Brain@McGill, a focal point for interdisciplinary collaborations in neuroscience research drawing on the vast reservoir of expertise at McGill and leading institutions around the world.